Another charming book by Dr Seuss, introducing young children to the wonderful word of rhyme. Once children can recognise the words, they will discover they can read an array of new words by merely changing the first letter. 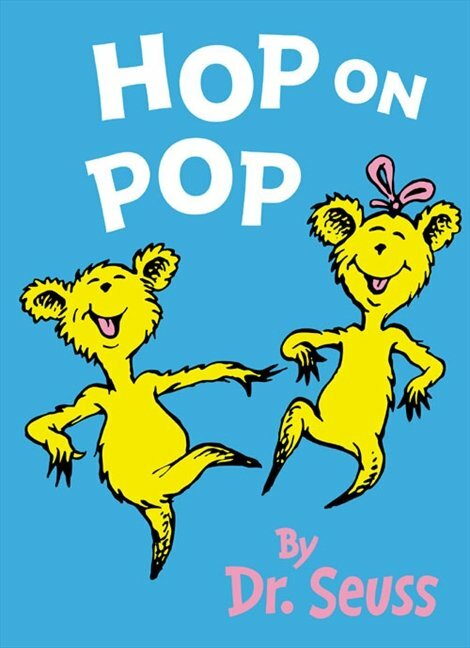 The repetitive use of basic and short vocabulary (CVC words) throughout Hop on Pop makes it ideal for targeting a variety of speech sounds (see the list below). The colourful and exciting illustrations closely match the text, thereby supporting children’s comprehension. I also like to use this book to teach prepositions, such as in, on, up, down, as they are repeated a number times throughout the story, and the illustrations further reinforce the location concepts. For more speech and language goals to target using Hop on Pop by Dr Seuss, see the list below.